I don't know about you, but even after all these years of UNIX I still have some trouble interpreting octal permissions in my head. In this episode, you'll learn about a special form of the integer literal syntax that can take the math out of bitfields. 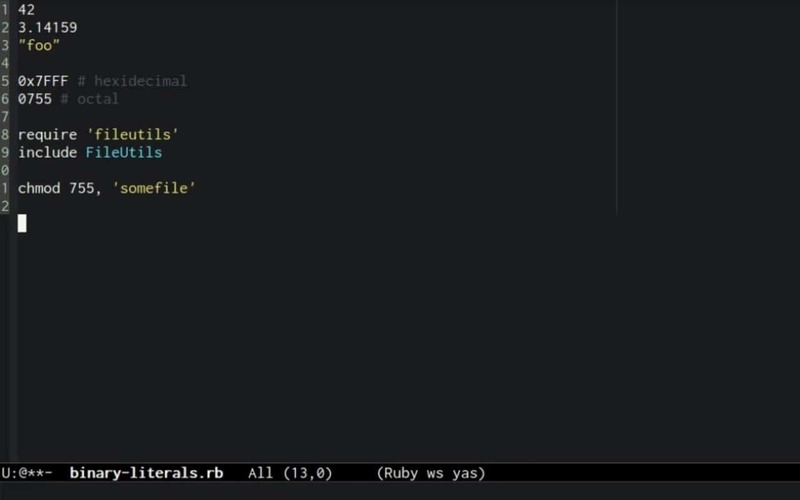 You probably already know a lot of the literal syntax in Ruby. Stuff like literal integers, floating point numbers, and strings. Octal numbers are useful for things like specifying unix file permissions. Ruby also supports a slightly less common type of integer literal: binary literals. I don't know about you, but even after all these years of UNIX I still have some trouble translating octal numbers into permissions, and vice-versa, in my head. This is one place binary literals can come in handy. Let's take a look at the previous example, only using a binary literal this time. First, we'll start with a reminder of the order of permissions bits. From left to write, we have permissions for user, group, and other. Now underneath that, we'll spell out our permission mask as a binary literal. Just to check, we'll translate that to octal form. Now with our permissions mask in hand, we can set permissions, confident that we've set the desired bits. And that's it for today. Happy hacking!